The gardens at Dobris Castle in Prague are elegant, balanced and meticulously planned. They rely on structure and geometry for part of their appeal, as they pull all elements of nature, sculpture, color and form together for the most pleasing harmonious effect. 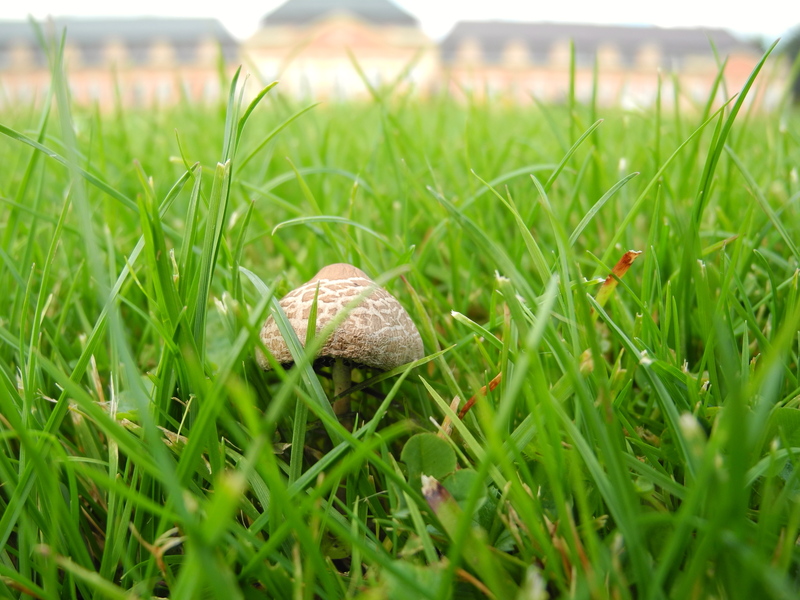 On the grounds of Dobris, a small mushroom felt bold. He popped up his crown in the middle of a sea of expertly cut grass. He could hide fairies under his crown, he could host mini parties for ants, or provide shelter for those who allow themselves to travel on the wings of thoughts turn to imagined and magical ideas. Mushrooms are self aware when they are underground, and this little peaked one selected the exact spot from which to emerge. He sought to illustrate his appreciation for beauty and form by echoing the peak roofed castle building, and also to contribute to it. With skin patterned like cobblestones and a bell shaped form, the little mushroom spoke the language of the land as he rang out loud and clear, ” I am here! I am the treasure you can find if you look closely at the details!” What a brave little mushroom, to peek up in a a sea of green perfection. Thank you Jane! Sometimes the words flow, and sometimes it is a struggle. Lucky for me, this little mushroom provided the inspiration. Previous PostPrevious The Joke’s On Me!